The way our brains communicate within themselves and the way we communicate between ourselves seem to be increasingly similar. In a recent report, An Embedded Subnetwork of Highly Active Neurons in the Neocortex researchers from Carnegie Mellon University observed that in a part of the brain called the neocortex neurons show the same pattern of behaviour as those displayed in social networks. Neurons are the brain’s transmitters of information. They transfer signals either electrically or chemically. However in the seems that in the subnetwork of this particular part of the brain some neurons are more active than others. Alison Barth is the Associate Professor on the faculty of the Department of Biological Sciences at Carnegie Mellon University (CMU.) To assess the firing of individual neurons she invented the fosGFP detection method which was used in a transgenic mouse. This type of functionality allows the observer to determine the how much a given cell is stimulated without damaging the cell itself. In a previous article HTM: New Algorithms And A New Way Of Programming we discussed the work that Jeff Hawkins was doing on Hierarchical Temporal Memory in which he is using the physical structure of the surface layer of the neocortex to determine how the brain efficiently codes information into memory in the most energetically economic way. The algorithms that he is developing are never going to be an exact copy of the brain but it is possible to get a model for coding and decoding information that is a very close approximation of how the brain works and thus benefit ourselves accordingly. In the Victorian age the workings of the mind were compared to the leading technology of the time which was steam. “Letting some steam off” was an expression that entered the language amongst others that reflected this kind of thinking. Latterly in the computer age there has been a tendency to model the brain as something akin to a computer and associated paradigms have emerged around that idea. But as we learn more and more about how the brain really works we can see that what actually goes on in our heads and what goes on in the world are inextricably intertwined. The steam age and the computer age as marvellous as they were may only be very crude approximations of the technical sophistication of our own brains. With each new discovery in the field of neuroscience it becomes increasingly more possible to use this information and design and engineer systems based on the systems that go on inside our skull that work very well for us. As we discover and observe phenomena like information transmitted through social networks working in a very similar way to the way neurons move signals through our brains there is every reason to suppose that future discoveries may reveal more surprising connections between what goes on inside inside our brains and what happens outside in the world. If the most fundamental network of signal transmitters we have acts like one of the largest social networks that we have created (leaving aside how it is managed) then it is reasonable to expect that there are going to be plenty more lessons to be discovered and learned over the coming years. Sean O’Sullivan is the Co-Founder and CEO of Rococo. The original vision of the company was to make it easier for developers to stitch proximity function into their apps. Sean and his colleagues noticed that the Application Programming Interface (API) of every Bluetooth stack (the way protocols that communicate with each other are sometimes organised for convenience) was completely proprietary. They figured that they could create value by creating a common and consistent API using the Java language. As well as helping the work on the technical standard — JSR-82 — for connecting Bluetooth with Java, Rococo provided a set of tools that enabled developers to develop apps that would enable them to take greater advantage of Bluetooth. In addition they licensed their own implementation of that standard to the mobile phone handset manufacturers. As of June 2010 Rococo’s technology was deployed on over a 180 million handsets worldwide. However, the advent of smartphones has produced new challenges. For the most part they do not use the JSR-82 standard. In response to these changes in the mobile landscape Rococo have developed a product using their own proximity platform called LocalSocial. How did the changes in the market lead to the deveopment of LocalSocial? “We’re dealing with proximity. We are all about making it easy to detect if you are near a person, a business or a device of interest. Near, in our world means anything from two feet to thirty or forty feet. “Location is a well-served part of the market at the moment. Engineering on mobile handsets is incredibly well-serviced. The core functionality of figuring out where you are is done by a combination of GPS, cell ID and reverse WiFi lookup. What is the difference between Local Social and Foursquare? “Foursquare is really two things — an app and a platform. We are really much more a platform. We don’t necessarily have a bell weather app as yet that shows off the platform. “One things that we do have in common with Foursquare is that we also believe that we can monetize the interactions between businesses and people as part of what the platform can do. Why would anybody want a proximity device? What would be the use of it? “For handset manufacturers smartphones have been taken a lot of the action over the last couple of years but social networking technology has also been driving a lot of innovation on those platforms. “Mobile apps have been a huge driver in user activity and user acquisition for the social network sites. In one of our demos we show what happens when you have Linkedin working with proximity. “One of the things you can do is share your information (you control the amount) with people that are nearby. Conversely you can browse the Linkedin information of those same people. “This can mean you can search for someone in the room who is interested in social media or interested in Bluetooth or whatever. “The core that makes LocalSocial tick is that with your permission we store information about your Bluetooth MAC address – your unique Bluetooth address contained in the chip on your phone – online. We let you associate other information with that and decide how that might be shared with people that are physically near to you. “We have profiles that contain versions of you social network settings. For example if you are in what you might call work mode you only share your linkedin information. If you are in say, party mode, you can share your Last.fm information for example. The National Digital Research Centre (NDRC) is an independent enterprise that endeavours to bring ideas nurtured in the academic world into the commercial marketplace should they be suitable. NDRC’s first projects began in 2008 when NDRC itself became operational and it is currently collaborating with 34 partners both in Ireland and internationally. Although receiving a majority of its funding from the Department of Communications, Energy & Natural Resources NDRC is not a State agency and is set up as a not for profit company. We spoke to Amy Neale, Programme Manager and asked her why there was a need for NDRC or something like it. “From our point of view we are focused on translating good research investments into commercial impact. So we are focused on what we would call translational research — taking good research outcomes and actually creating some market capital value on the back of those. That can be through licensing technologies or creating new spinout companies. We are very much focused on creating value for our partners and for the economy. “We have put a slightly different model in place to the pipeline model that you might see elsewhere. We are very much focused on the types of outputs — either commercial licenses or new start up companies — that are in the digital space. “We set up and incorporate joint ventures between ourselves and an academic partner and an industry partner all of whom are sharing the risk to share the reward. Projects tend to be between eighteen months and two years. So we are just beginning to see the first outputs now and the earliest results from some of those projects. Determining value is, “…an ongoing process throughout the lifetime of the project. From the very first engagement what we are trying to do is drill down into the market potential and who the customers are likely to be for any given idea. “We start off with an evaluation process before we make a decision to invest in a project. We’ll ask people who have a good idea to put it down on paper. We will give them guidance on doing that but we will ask probing questions about; the problems they are trying to address, where the solution comes from, what the market looks like, what the competitive landscape looks like, who the customers might be. We’ll begin to probe what they think a likely route to market will be at that stage. Where in the funding and enterprise system does NDRC fit in? “What we are trying to do is create a bridge between research investment and venture capital. What we are trying to do is derisk technology before they go before any kind of venture investment. We are looking to reduce some of the risks that investors would typically see in the early stage technologies that are coming from the research base. “For us that means getting some kind of validation from the marketplace. All of our projects have a focus on user trialling and market trialling at some point during their lifespan to ensure that we are not just developing technologies that nobody wants. If you have a project that NDRC may be interested or simply want to find out more you can contact them via their contact details at the website. Silicon Valley, located in Northern California in the United States, is the epicentre of the global high-tech industry. It is synonymous with the world’s largest technology corporations including Apple, Google, Facebook, Cisco and HP. This 30 by 15 mile stretch of land houses a wealth of resources waiting to be exploited by Irish companies willing to take a calculated risk. There are major opportunities for new Irish technology companies to make a global impact through contacts and funding available in the Valley. Silicon Valley contains a huge concentration of venture capital (VC) firms who are seeking the next eBay or Intel. Many of these firms are centred on or around Sand Hill Road in Menlo Park – considered to be the Wall Street of Silicon Valley. One Irish company that is currently seeking to take advantage of the opportunities available is TapMap, founded in 2009 by Philip McNamara. The company uses mobile platforms to publish retailers’ price and inventory to make their products accessible to local consumers. An obvious disincentive is the physical distance from Ireland. California is just over 5,000 miles away and 8 hours behind in time. There is currently no direct flight between Ireland and the Valley, forcing commuters through other international airports to travel between the two. American VCs will expect you to set up a locally incorporated company which involves obtaining American legal counsel. Visas that allow you to work in the States can be hard to obtain and sometimes slow to arrive. Give some thought to your American mobile phone operator. Verizon’s current 3G phones do not work in Ireland. AT&T or T-Mobile use the same technology as Ireland (i.e GSM or UMTS) so this may be a better option if your phone needs to travel home with you. Some of these obstacles can be overcome by aligning your company with a business start-up centre who can help with VC meetings, office space, recruitment and advice. One such centre is the Irish Innovation Centre which opened last year. What if you decide that Silicon Valley is not for you? One company who has decided to stay in Ireland is Cork-based Ferfics, a developer of intellectual property and microchips for radio frequency applications. Standard photovoltaic cells provide the means of turning light into electrical energy and are commonly found on solar panels and other suchlike devices. They are usually constructed using semiconducting materials such as silicon. While costs of manufacture have fallen over the years, they are still relatively expensive in relation to the costs saved by their use. They are also confined by the nature of their construction materials as to how they can be constructed. This limits where and how they can be used. Instead of silicon, dye-sensitive solar cells (DSSC,) a technology discovered by Michael Grätzel at the École Polytechnique Fédérale de Lausanne, uses a layer of dye sensitized nanocrystalline semiconductor oxide particles. This process has numerous advantages both in terms manufacturing cost and range of possible applications. 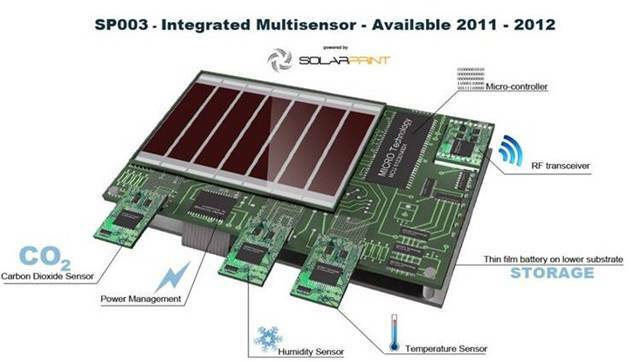 Solarprint is an Irish company founded in 2008 by Dr. Mazhar Bari, Andre Fernon and Roy Horgan. It is based in an 8,000 Sq Ft site in Sandyford, Dublin, and employs 21 people at present. Solarprint has made its own contributions to DSSC technology by making innovations in the constitution of the dye sensitive layer which allows for greater ease of manufacturing. One big advantage of DSSC technology is its ability to produce electricity at very low light levels. By being able to harvest ambient light from gloomy days and indoor sources it can power or supplement the power for remotely located sensors and other devices. Also, because DSSC lends itself to being screen printed it can be formed and shaped in such a manner that it to be more easily incorporated into the design of a given object. Say, the roof panel of an electric car. Roy Horgan is the Business Development Director and Co-Founder. We asked him why DSSC technology was so important? What are you doing that is different? “Most people that are looking at this want to do building integrated photovoltaics. They want to cover buildings with them. Because we have developed a low light solution you don’t need to cover buildings initially. First, get the building’s energy management system efficient using wireless networks. How efficient is this technology? “We are developing the lowest embodied energy photovoltaic technology that currently exists. We use eco-friendly materials and our solutions lend themselves to power energy management systems both today and in the future. The biggest issue today is not your cars, not your planes — it is the built environment. 40% of all carbon today is from the built environment. “Before you put your solar panels up, get your building right. Reduce the power consumption of your building. An energy management system can reduce that need for power anywhere between 25 and 50 percent with an integrated smart management system. Not are only Solarprint developing this new technology they are also planning to manufacture and market their own products. “We are planning for growth. Everything we do is for growth. We think six, to nine, to twelve months ahead. From human resources, to engineering, to how we deal with customers. “We are trying to infiltrate into all aspects of downstream activity as we don’t know where we will get traction just yet. But what we do know that every place we have infiltrated we have got traction. ‘Ultimately our biggest challenge is manufacturing at scale and we can only bring on the best people and be advised by the best possible people we can. Net neutrality is the concept that internet users will have access to content on the internet without restrictions from governments and internet service providers (ISPs.) Also, broadband providers can have no input outside of current legislation as to what content will reach the consumer by throttling bandwidth to certain sites. There are concerns that ISPs and other broadband providers presently have the potential, by virtue of their ability to connect users to the internet, to govern how content gets delivered to users and that this potential to govern access needs to be regulated. For instance, amongst other options, they can charge different fees for different download speeds. The possible imposition of net neutrality legislation in attempt to regulate this sort of activity has sparked opposition from those who wish to preserve the open nature of the internet. The future of net neutrality in the U.S. is still in doubt as internet provider Verizon has filed an appeal challenging the Federal Communication Commission’s (F.C.C.) rules on the issue, which were introduced on December 21 last. The FCC’s rules are designed to prevent ISPs from blocking, or charging higher prices for access to, certain sites or applications, but are less stringent on mobile internet providers and do not explicitly prohibit mobile ISP’s from practicing ‘paid prioritization’, where internet content providers who pay ISPs will see their content delivered to users more quickly, creating a hierarchy of internet access. The Verizon court challenge, filed in the Federal Appeals Court in the District of Columbia, and an ‘Internet Freedom’ Bill introduced by Tennessee Republican Assemblywoman Marsha Blackburn both assert that the FCC exceeded its authority in introducing these rules. Opponents of net neutrality point to the lack of regulation of the internet as being the key to its success and claim that attempts to control the behaviour of internet service providers are against the spirit of deregulation that has characterized the internet’s success. Rather than create a level playing field for all, net neutrality will merely be a victory for large companies who hog bandwidth. As regulators and national governments struggle to reach a consensus, the future of net neutrality, and by extension the way content is moved around on the internet itself, is unsure but what is sure the eventual outcome will affect every user of the net. The next event of the Dublin Web Summit series takes place on the 8th of March. They are being held roughly every four months to reflect the need to stay current with the rapidly changing tech environment. Previous speakers from overseas have included Jack Dorsey, Chad Hurley, Dave McClure amongst others. Irish speakers in the past have included Iain McDonald from Skillpages (formerly Weedle), Kirstie McDermott and Darragh Doyle. In the video Paddy elaborates further on the need for the Dublin Web Summit or something like it. He also provides more information on the following points. The inaugural session begins at 5pm on March 8th and you can find more details about speakers as they are announced at the site for the Dublin Web Summit. You can also purchase your tickets there as well.